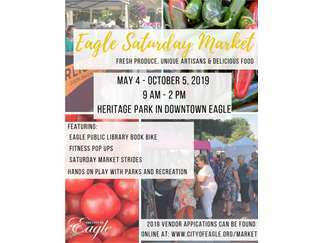 The Eagle Saturday Market is a handmade market located in the heart of downtown Eagle in Heritage Park. Stroll through the park and find an array of arts and crafts along with local produce, herbs and flowers, woodwork, specialty food items and freshly prepared food. Every Saturday, from May 4 - October 5, 2019, the park comes alive with the melodious sounds of local musicians and community members coming together to support local micro-producers.